Ancient Stones - Lothian - 046 Johnnie Moat Stone, Prestonpans. 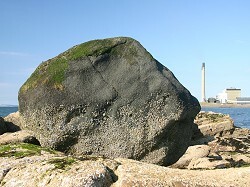 The Johnny Moat stone, a large glacial erratic, can be found about 30m from the sea wall just off Prestonpans and is fully exposed during low tide. The boulder measures some 2.70m long x 1.80m wide x 1.80m high and is of a dark blue whinstone with a different texture to the local surrounding rock which is sandstone. It sits on a rock shelf known as the Girdle Rocks. Prestonpans is to the east of Edinburgh, on the B1348 To reach the stone follow any of the short streets leading from the main street towards the sea. The stone is quite obvious. Parking is readily available along the main street in Prestonpans. The origin of the boulder's name well known locally. It is named after a huge figure of a man, big Johnnie Moat, who was Harbour master and Ship's Pilot at Morison's Haven in the 17th century. Local folklore tells us that young lads walking along the foreshore were so impressed by the size of the boulder that it reminded them of the legendary man himself - hence the name that has stuck for over 300 years. While the boulder was almost certainly left behind by the glaciers during the last Ice Age, many other charming and outlandish explanations are also in circulation - one suggests the stone to be a meteorite from outer space or blast debris from the erupting volcano that was once Arthur's Seat in Edinburgh! Local legend recalls that "as long as the Johnnie Moat stands on its rock shelf the town (Prestonpans) will flourish". And whilst it has stood there some 13,000 years since the end of the last Ice Age, a severe storm in December 1952 toppled the stone from its resting place. On March 10th 1992, the East Lothian News reported that the Johnnie Moat was returned to its shelf after toppling to the beach in December 1952, forty years before. Sadly, those 40 years were amongst the most miserable in the history of the town with the closure of the colliery, brickworks, potteries and brewery with the loss of thousands of jobs. Perhaps the legend was true after all? Luckily, in 1992 the resources were found to lift the toppled Johnnie Moat back on Girdle Rocks shelf; the contractors who were busy laying a new sewerage system along the foreshore. While Johnny Moat does not have any apparent connection with prehistory, it is a fine example of a local legend associated with a large boulder. Who is to say that this association may not actually have its roots in even earlier times? Note: this site is best visited at low tide, when you are usually able to gain access to the stone. Tide predictions can be found on the Internet and in the press. Always take care when visiting stones in tidal areas.